Chocolate, Chocolate, and more Chocolate. These muffins are scrumptious !! Brownie-like, these muffins seem best served with milk, but also good served along with afternoon tea. Nuts, such as pecans or walnuts, are a good addition. Preheat oven to 375 degrees F (190 C). Spray 6 giant-size muffin cups or 12 regular muffin cups with non-stick cooking spray, or line muffin cups with muffin or cupcake liners. In a microwave-safe bowl, melt chocolate in the microwave on medium-high heat for 25 second intervals, stirring in between, until smooth. Set aside. In a large bowl of an electric mixer, cream sugar and butter. Beat in eggs, then add sour cream and milk. In a small bowl, stir together flour, baking powder, baking soda, and salt. Pour flour mixture into butter mixture and stir together by hand. Stir in melted chocolate, then chocolate chips. Fill each muffin cup about three-quarters of the way full with batter, and if desired sprinkle some chocolate chips over top of batter. Bake for about 20 minutes for standard-sized muffins or 25 minutes for giant muffins, or until a toothpick inserted into the center comes out clean. Transfer muffins to wire rack to cool completely. Muffins are best eaten fresh. Makes 6 giant or 12 standard muffins. These muffins were really tasty! I simply loved them. They were pretty easy to make and I managed to get about 20 mini muffins. Everyone loved them. Amazing! it was simply great and tasty! I just made these and if you are a true chocolate lover, you will love these. I made them high-end bits I bought on line and they are dense and insanely wonderful! your muffins were simply great! i got high marks for my home econs test just for these lovely muffins! excellent for chocoholics like me. too sweet and too dry. I love these very much. They're my favorite dessert!! Thank you very much!! These muffins are great! But I thought they left an overly sweet after taste. Less sugar could be used. I halved the recipe and it still turned out marvelous! The texture is moist and soft. I didn't have fresh milk and so substituted with leftover evaporated milk and some water. Added walnuts too. I used only 50g of brown caster sugar and it turned out not so sweet. Will increase the sugar content to 75g next time. These are really good, not too sweet or too bland. Perfect! amazing!!! a bit hard on the outside, but soft inside!!! almost as good as tesco's muffins!!! Really good, I got 1st place in a 4-H muffin baking contest. But they were a bit dry. amazing, simply amazing. i could eat a kabillion of these. The best ever....my husband loved them and he is very picky. I have never eaten another better tasting muffin than this one. Pure delicious perfection -- I felt like I was eating a brownie. Easy to make, and quiets the chocolate craving immediately. Be aware, though, that if you omit the chocolate chips (like I did the second time) it disrupts the balance of the recipe. The chips contribute moisture, flavor, and sweetness, and without them you end up with something that makes a delightful cupcake base but is a tad bland to be eating on its own, as a muffin. So remember to adjust the ingredients accordingly. Just made it today for kids' after school snack... they love them. Easy, quick recipe to make, with full of heavenly chocolaty taste and very delish. Thank you for sharing the goodness to goodness recipe. I'll try some others soon. 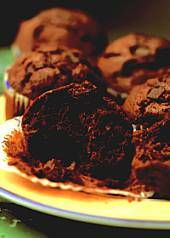 MINE CAME OUT OK, THE BATTER WAS VERY LIGHT IN COLOR, I LIKE REALLY CHOCOLATEY MUFFINS. AND SOME SLIGHTLY BURNED ON THE OUTSIDE, I DID USE BUTTER FOR THE CUPCAKE TINS. COULD I ADD MORE MELTED CHOCOLATE? Disappointing. The first batch I made were a little crispy on the outside, not very dark and dry. They didn't keep overnight. The second batch I made I used extra chips in and on top but they still weren't that great. A bit too dry, I added an extra 1/2 cup sour cream! It's yummy and so moist. My family and friends love it. I just made these, and if I could I'd give these muffins a 10 - THEY WERE SOOOOO GOOOOD AND JUST WONDERFUL. I made a miner adjustment and added some peanut butter chips too. And I think I've died and gone to heaven - they were so yummy... I will be making these alot more often. And also for the holidays too. THANK YOU ! THANK YOU ! THANK YOU ! My husband loves these muffins. wow. just wow. these are quite possibly the most amazing, incredible muffins i have ever had, and i'be made lots of muffins! my family ate them in one night! Easy and so yummy! Thank you for sharing! !